This is such a simple recipe that I can remember from when I was just a little girl…my mom (Paula) made it often in the summer and is simply so delicious with BBQ or just as a light lunch by itself!! An added bonus for picnics and BBQs: there is no mayo spoil in the sun/heat. 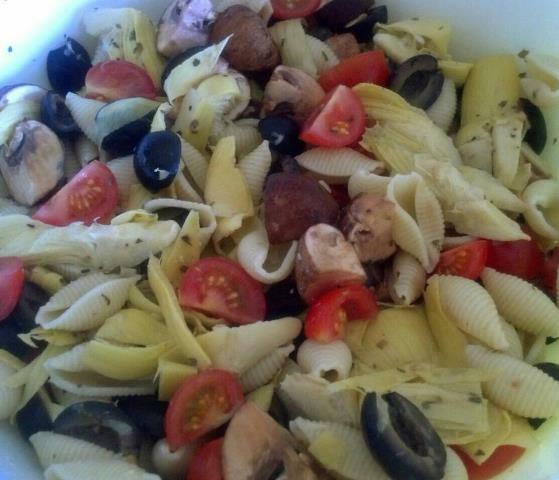 I chop up everything as close to the same size as the shell pasta. And I just add however much I like of each ingredient. Chill and eat. Even better if you can let it sit overnight in the fridge! !